Hi Everyone! I hope you all had a good weekend. Here in MN the weather has finally turned, so my windows are all open and the fresh air is blowing through the house. We’ve had lots of heat this summer, with many days so humid that you can hardly breathe. This is such a refreshing break from all that heat, and for that, we are all grateful. I’m also grateful to have a few work deadlines behind me. Mom and I finished up and turned in our ideas for a new fabric line. In fact, that is the third line that I have painted up this summer. Unfortunately, I can’t share any sneak-peaks just yet. With all the fabric designing, I have taken a bit of a break from quilt designing. Normally I would have my fall products all planned out by this time, but after the craziness of the last couple years I decided to skip fall market this year. Instead, I am taking some time for myself – to catch up on everything I have fallen behind on – to start new fun projects – and hopefully get back to enjoying the creative process. Those fun new projects have included redecorating a couple bedrooms. That whole process leads me to my post for today! Part of redecorating bedrooms means sewing new bed skirts (or dust ruffles), pillows, curtains, etc. When we came out with our “Shams with Style” book, I had lots of people ask me to come out with patterns for curtains and bed skirts. To me, a bed skirt doesn’t make an interesting enough pattern to put out on the market. However, I thought I would just do a quick tutorial for those who want to learn how I make their own. I don’t particularly like making bed skirts (boring! ), but knowing how to make them means that I can make them out of the fabric of my choice. That can really help make the room! To get started, let me just say that bed skirts are really easy to make. It only took me about 3 hours to finish the whole thing. The style of bed skirt that I like is really basic, with no frills or fuss, but very skilled use (NOT) of velcro and hot glue. This technique is one that I learned from my Mom. She used to make her bed skirts by sewing a ruffled fabric to a large rectangle of lining fabric that fit between the box spring and mattress. The problem with that method is that everything always shifts around. That’s when Mom started using the velcro method. See the photo below? It shows a line of velcro stuck to the edge of the box spring and another line of velcro along the top edge of the bed skirt. This set-up eliminates that shifting problem. To attach the velcro to the bed, you can either buy sticky velcro or use a hot glue gun. 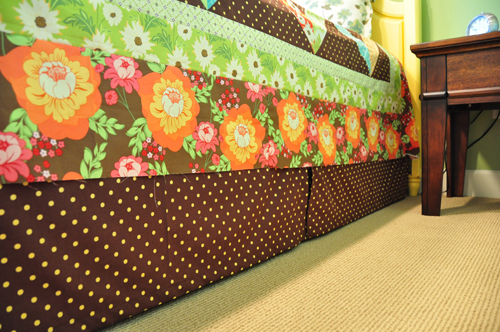 After sticking the velcro to the bed, measure the three sides separately to get the length for your bed skirt. As you can see in the photo above, I usually add an extra 1/2″ on each end so the two sides overlap slightly and you can’t see the box spring through the opening. As you can see in these photos, the style of bed skirt that I like doesn’t involves ruffles like some do. I prefer a flat bed skirt, with a little detail in the center that looks like a pleat. I do the same thing on the long sides of the bed. To figure out what size to cut the pieces, refer back to the measurements that you’ve already taken around the three sides of the bed. Also measure the drop from the inside edge of the velcro on the box spring, down to the floor. Let’s just say that’s 16″. Let’s also say that the long sides of the bed measure 78″, then divide that number by 2 (because we are doing it in two pieces) = 39″. Next, add for a 1″ double hem along three sides and a 1/2″ double hem along the top. 16″ + 2″ + 1″ = 19″ for your drop. 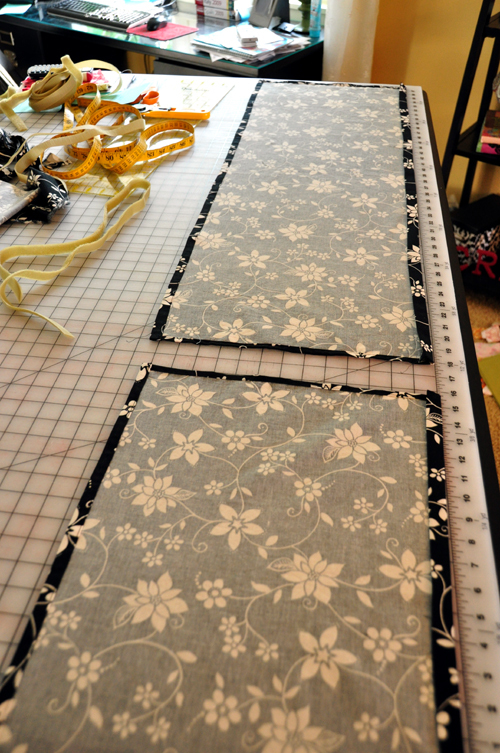 So, cut two pieces for each side that are 43″ x 19″. You with me so far? BTW, that was the hardest part of this whole process! Repeat this process to get two pieces to use along the foot of the bed. Using a hot iron and some steam, fold the edge over and press, so your drawn line is right on the edge of the fold line. Fold up the hems one more time, so the raw edge is hidden inside all the layers. This is how you get a 1″ double hem or a 1/2″ double hem. 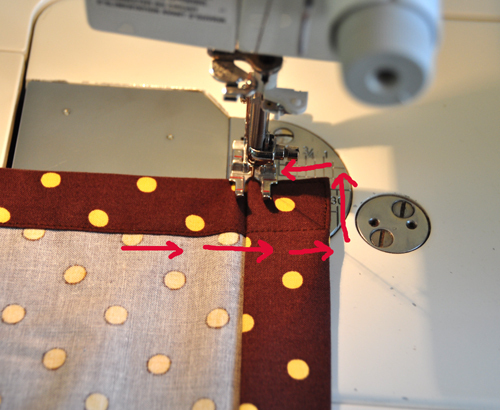 Next, go the machine and hem as shown, using matching thread. Only hem the three sides that won’t have velcro, as that side will get hemmed when we add the velcro. This photo shows how to do those bulky corners, so everything is tacked neatly in place. Next, lay out two pieces that will be connected to make a full length. The hem that isn’t sewn yet is laying on the right side of this photo. This will be easier to see when you are actually making it, because three of your sides will have a wider hem. The bed skirt in the photo was the first one I made and I started out using the same size hem on all sides. After seeing the completed bed skirt, I decided that having a small hem on the three sides that showed didn’t look very professional. I then doubled the size of the hem, going from 1/2″ to 1″. Cut a small piece of fabric to make the “fake pleat”. I cut mine about 8-10″ wide, with a 19″ drop. Hem on three sides as you did with the other pieces. Lay the two long pieces right next to each other and center the “fake pleat” on top of where the two pieces meet. Pin in place. 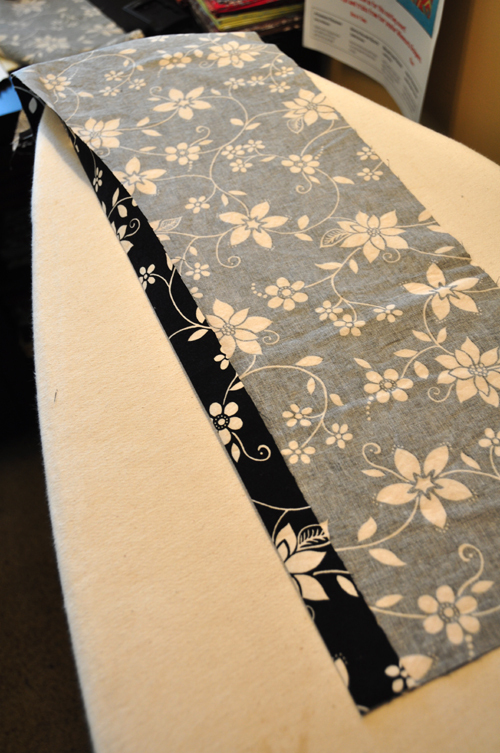 Next, add the velcro along the top side of the bed skirt (along the right side in the photo above). Just be sure that you are using the side of the Velcro (fuzzy or rough) that corresponds to whatever you stuck on the bed. It’s very important to pay attention to this throughout the process!!! Stitch along the left edge of the velcro also. I hope you liked this method! You can thank my Mom – and by the way, she reads the comments! Now, I am going to start machine quilting this quilt so I can show you a finished room. Maybe two finished rooms . . . . This entry was posted in Decorating, Quilting and tagged how to make a dust ruffle. Bookmark the permalink. Genious! I have made several dust ruffles in the way you first described and yes, they are always pulling out-even when you first put the mattress back on!. I actually thought about velcro the last time, but could figure out how to attach it-never occurred to me to use hot glue! I can’t wait to see that quilt completed. From what I see, it is gorgeous, especially with your lime green walls! Beautiful use of meadowsweet! By the way, any idea where you can get the velcro reasonably-the last time I bought some it was a little pricey! Joann’s in Washington State sells white 3/4″ velcro in pre-packaged 1 yard pieces, name brand “Sew-On”. I purchased enough to go around the bed…and at 43 cents(on sale) per yard it was a steal! Lucky you…. I decided to try this method for the side & end of my guest bed…. our price in Canada for the stick on is $1.99/meter so I paid approx $25 just for my velcro…. oh well…. I am really looking forward to trying this method, thanks for the tutorial on it! I like this. I understand about the slipping. My bed skirt right now hangs longer on one side. That is brilliant. I made a couple of dust ruffles a year ago and found the amount of fabric to be unruly. This would have saved me such aggrivation! 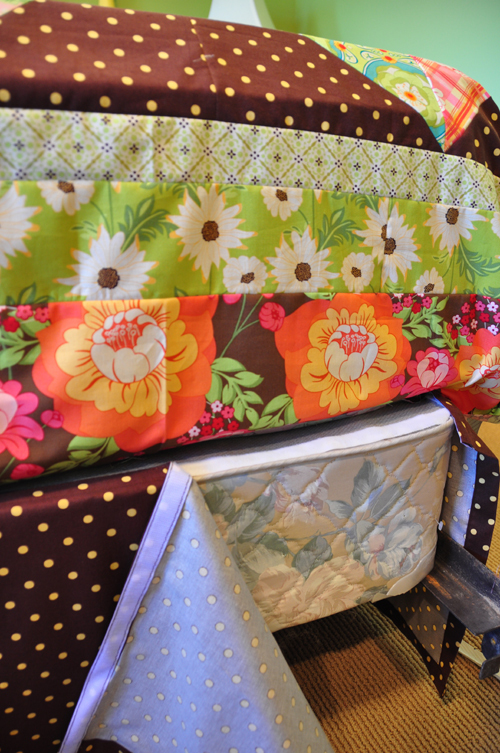 What a great way to make a bed skirt. It’s much less cumbersome than the other way. I’m going to have to give it a try. Thanks! Oh my, I have needed this post for so long and you made it look like, even I can do it. Your mother is a life saver, this goes to the top of my must do list. I bought a white fabric with red crewel embroidery at Calico Corners to make a bedskirt for my red and white quilts. Now I have a way to do it. Thank you so much. Thank You Thank You Thank You! I have a bed that sits up high and I can never find a bedskirt that is long enough. I am now going to make one!!! What a good idea! 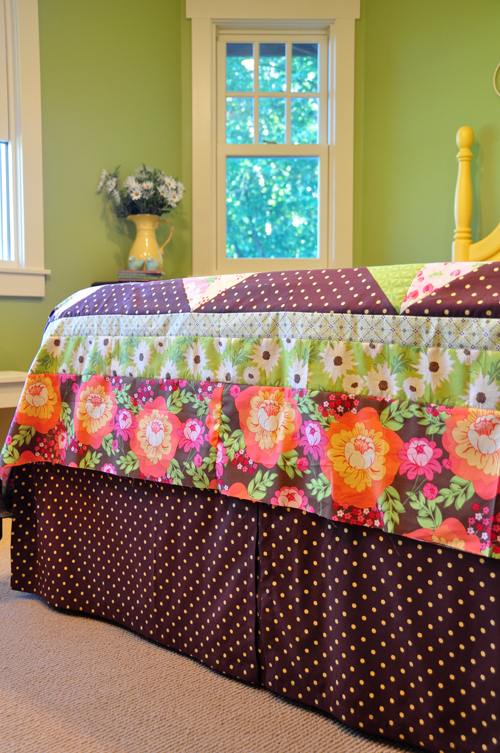 I will save this tutorial for future reference – a great way to get a matching bed skirt! All you can find in the stores is beige & white. What a greaat idea!! I’ll share this with friends. Thank you so much for this! I have been shopping and measuring and calculating and stressing about this for two weeks. Now I know I can do it! I’m lovin this. It looks so simple. I need to bookmark this page. THANKS! The velcro is a great idea. I’ve made one bedskirt in my life and I would never make another using the old method. I need 2 bedskirts and instead of buying them I’ll have to give this method a try. I t looks nice and easy without all that fabric. I really like the “pleat”. Thanks. I am finishing up a quilt and wanted a new bedskirt to match. Now I can add this to my list of things I want to get done. My last bedskirt is a pain trying to get it to stay and with a taller bed it doesn’t quite reach the floor. Bravo Heather and Mom!!!! 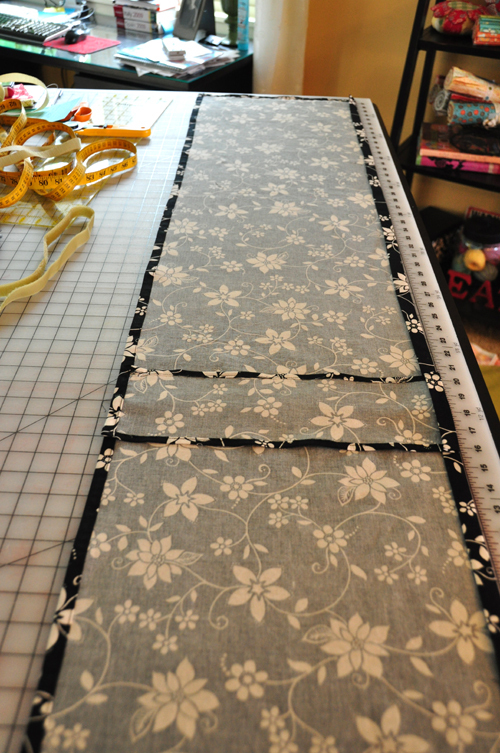 I have made a couple bed skirts using the velcro but…. still sewed them to a topper that STILL shifted – UGH!! I have had the light bulb moment and wonder why I didnt think of this!!! My skirts are going in the wash, and I will get some more velcro and adhere to the BED foundation!! I just want to add, that people may want to be sure to sew the soft side of the velcro to the skirt (just in case they want to wash it and it wont “pick” anything else. Can’t wait to see the finished room. Your tutorial was great and you are soooo generous to share this!! Big ol’ hugs!!! This is a great tutorial! !Thank you sooooo much for this tip about the velcro! I definitely would’ve made the mistake of sewing the wrong side on the bed skirt! I used elastic on my bed skirts which do sag…..thanks for this tip on velcro which I will probably find it cheaper at Walmart store. Our box springs sit on “hangers” and what is more difficult is that my DH wants the wood on the sides and foot to be exposed — bed skirt tucked behind the wood. I was thinking of placing a shortened version of the fake pleat where the hanger is and tacking it to the two lengths just below the hanger. The hanger and the tacked section would be hidden by the wooded rail. Hi, just found this pose and your comment about the tension rod for a bedskirt..Genius!! is at that level, then the area underneath is open….so your idea is brilliant!! You could make the skirt to length starting from the board. Instead of sewing the velcro to the skirt on the back, sew it to the front. Then glue or stick your velcro to the back of the board on the bed frame to attach your skirt to. I love it!!! thank you to Heather’s Mom & Heather. Love this…so easy to change looks with this method. Ingenious. Wow, what a great tutorial! I’ve been wanting to try a bed skirt but had no idea how to go about it. Thank you! Can you say brilliant? Velcro!!!! Thanks, Mom. I really appreciate this tutorial, so simple. It will be hard for me to glue the velcro to the box springs (in the sense of ruining it), but why not? Such a good solution to the problem of battling the dust ruffle. 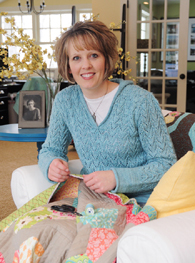 I am anxious to try this soon as I have a couple of new quilt tops for my ust waiting for me to quilt them. Thanks Mom….very similar to what I did for the crib skirt for our first Granddaughter. Aren’t we clever girls (G)!!!! What a great idea!! I also have wanted to try a bedskirt and I think I can do this! Your mom is so clever. I guess it runs in the family. Thanks for sharing. Thanks for the idea mom and the tutorial Heather. I have a Bed and Breakfast and so I make on average 5 beds a day. I have commercial bed skirts on 4 single beds and as I make the bottom of the bed the #$%^&*()_ bed skirt always seeks its way under the bed mattress. I will make matching ones this Winter with your tutorial help and for now I am going to get the two sided sticky velcro and put it on the bottom of the box spring and the bottom side of the bed skirt to hold it down. This will help with making the beds each day and setting this commercial skirt just right. Thanks! I love this way better than doing all of the ruffling and sewing it on a rectangle piece of fabric! I did that once! And ONCE was enough!! Ha! Can’t wait to see the finished room! Thanks again for sharing! Thanks so much…I’ve made gathered bedskirts before but really prefer the more tailored look. I will definitely use this! 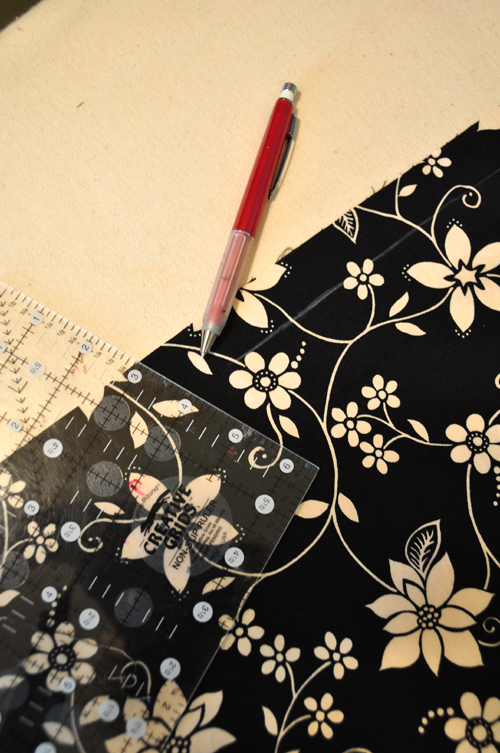 And thanks also for your bias strip tutorial…I use your method all the time to make bias binding! I am in the process of making a bedskirt to go with the quilt I made. Brilliant! You are so lucky to have such a creative mother. Thank you for sharing her with all of us. Enjoy your time off, but, remember to take time to play while catching up! Great tutorial, I love this style of bedskirt! YES!!! I’m in the market for bed skirts and this will be the ticket. Thank you so much for sharing this great method. You’ve made my day!!!!! Thanks so much for the awesome tip. 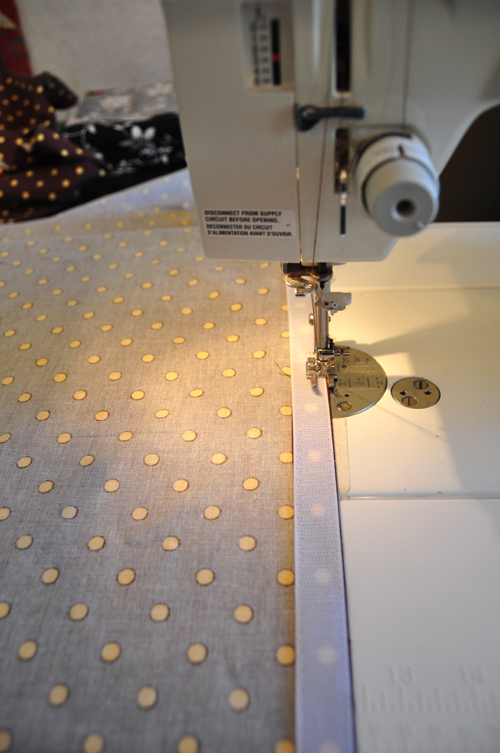 I so need a new bedskirt – now I can make one. My mom made the one I’m using so, so long ago. She’d be proud of me making another one. Great post!!!!! I cannot wait to do this! I am making new beds for my 2 boys and my 2 girls and quilts to go a long with them. Now I can make cute bed skirts too!! Thanks! This is exactly what I have been looking for, thank you so much!! Now this is the most ingenious thing I have ever seen. I am sure my husband will thank you when I show it to him, he absolutely HATES to help me put the bedskirt on our bed! Thank you so much for making my day! Have an awesome one yourself! Really—-hot glue it to the box spring. Wow, never would have thought of that. Thanks for the great idea. Wahoo!!!!!!! I’m going to be doing this too! Great post. I’ve done this before, but I’m still hesitant to hot glue anything to the box springs, but why not. I did, however, buy an inexpensive fitted sheet, put that over the box springs and hot glued the velcro to that. Sure makes it easier to iron the bedskirt when it needs it. Maybe the velcro could be sewn to the fitted sheet. That way, the fitted sheet could be laundered. Hi Janie, this is a little off the subject but I need to wash my quilt that has velcro sewn to it. Can I just put it in the washing machine or do I have to put some strips of fabrice over the velcro? Great idea! I was considering buying a grip deck (for about $90), goes over entire box springs, has velcro on it. You make your own 3 piece bedskirt to which you attach the other part of the velcro. They supply instructions. You do have to remove mattresses to put it over box springs, but at some point, I would feel like I had to clean it. I can save a lot of money just by buying only Velcro and attaching and I won’t have to ask my husband to remove the mattresses! Also great idea to attach velcro to a fitted bed sheet over box springs. Women are so creative and clever! Glad we can share ideas (and our mishaps) with one another. Thanks! I just found your tutorial and wanted to say Thank You (and to Mom!!) for it. My mother just recently purchased a beautiful new quilt and shams and pillows for her king size bed but there was no matching bedskirt (and her bed requires one). I am a fairly new sewer, but I felt sure I could make her a bedskirt, but had no idea how to go about it. This tutorial is just the thing – and you make it so easy!! Can’t wait to try it. I am so appreciative! Adorei… e do jeito que você explicou ficou bem fácil de entender… Obrigada!!! Just discovered this and it is AMAZING! Thank you thank you! This is brilliant!! I have four cats so my bedskirt is covered in fur and I can’t move the king sized mattress by myself to wash it. Problem solved!! I found this awhile back and am making one for my son’s room. I have a question about the fake pleat. Do you only sew along the top and not down the sides of each pleat piece of fabric so it hangs open a bit at th bottom to see the pleat? Also, i plan to sew this to a fitted sheet to go on the boxspring. Does anyone have any tips on doing it like that? I have the same question about the fake pleat. I am in the process of making one now and was wondering what you decided to do? Brilliant!! I have been looking for a bedskirt that matches everything else in the room. I’m scared to death to hot glue the velcro to the boxsprings, but I’m going to do it. I’ve been working on this for a few hours now. I’ve cut all the fabric, ironed it all, and done one side of the bed. It looks EXCELLENT!!!!! I added some giant rick-rac to the bottom of the skirt and it looks so great. My question is this: what do you do for the corners of the bed (by the foot of the bed)? The box spring is going to show between the two pieces unless I overlap the sides with the bottom, so I’m thinking of doing another false inverted pleat on each of the foot corners. Thoughts? I have already bought my fabric for my bed skirt but the giant rick-rac sounds great. I am going to add it to my skirt! I am going to do inverted pleats at each corner of the bed (by the foot of the bed). I’ve been wanting to make a bed skirt for some time now. My thought was to use a plain flat sheet to go between the box spring and mattress. But this is sheer genius! I didn’t even think about how difficult it’d be take it off whenever I needed to wash it. Brilliant! I will definitely be using this method when I make my bed skirt! PS I love this quilt on the bed with the polka dot bed skirt. I would love to see more pics of it! Lovely! I’ve been putting off making a bed skirt for our king sized bed for some time. This makes it look simple. I, too, like the simple style you used. I decided to use Tidy pins in place of the velcro. they work great. I can’t wait to try this….have been putting off making a skirt forever!!!! I love this, and will remember it next time I redecorate. In the meantime, I’m going to add velcro to my mattress to hold my purchased bed skirt in place! This is fantastic. I will definitely be giving it a try. FYI: I have made ruffled bedskirts attaching the skirt to a fitted sheet on the box spring. Put the sheet on the BS and mark a line all the way around with a purple washout pen. Actually you can use pencil or pen because it won’t show. Create your ruffle and sew it right sides together matching the raw edge of the ruffle to the line on the sheet. You will have to measure for the height of the ruffle taking into consideration the hem and “flip over” of the ruffle. You can also mark the sides and bottom in halves or thirds and make the same mark on your gathered ruffle to get it evenly full. Very easy and NOTHING shifts. Heather, The velcro idea is a simple but wonderful trick. I actually own the patent for the velcro attached dust ruffle. I designed and produced the needed velcro and glue in a neat little package along with instructions to use your existing dust ruffle and convert it to the velcro attached idea. I got raving reviews from anyone who purchased the kit. My most personal reward came from women who were handicapped. This method of not having to remove the top mattress to redecorate your room was a blessing for them. Unfortunately, I never seemed to be able to convince Buyers of the idea. I spent a tremendous amount of money and heart into the velcro dust ruffle idea to no avail. So, when I read this article I swelled with pride again. Go back to your readers and advise them to take their old existing dust ruffles, cut away the center section that lays on top of the box springs, attach the velcro to the top of the ruffle, attach the velcro to the box spring as you have indicated and their conversion takes about an hour for completion. My instructions also advises customers to always purchase the dust ruffle in the King size, that way, you can use it on any size bed. The extra length just tucks away easily at the headboard. Thank you for sharing your Mother’s idea with your readers, I am happy to know an idea I had many years ago is now being used in a similar manner. Sorry it didn’t work out for you! 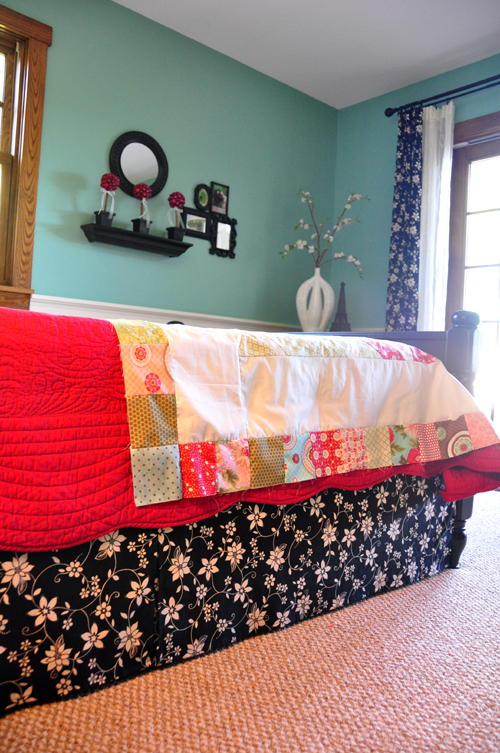 Thank you for sharing your idea of how to convert the existing bedskirt. I was trying to think of a way to resue it with the velcro method! Thanks so much for this!!! I have a purchased king size bed skirt that shifts really bad and I was going to cut it and add the velcro! Wasn’t totally sure it would work…but now I can “fix it” so it will hang correctly and look really nice! Brilliant! Had this thought in the early nineties, just never implemented it! Thanks for the great detailed tips! And, Thanks MOM! This is a wonderful idea. I’ve been debating making a bedskirt to match the quilt I’m working on, but dreading the huge amount of fabric and the frustrations that come with the more traditional method. This will be perfect. Thanks so much! Thanks so much for the thorough step-by-step and photos. I’ve had this idea for awhile, but definitely need the how-to written out. Can’t wait to try it! Let me start by saying that I QUILT, but I do not SEW. Thank you SOOOO very much for this great and simple idea. Even a non-sewer can get this done! Can’t wait to get it complete!!!! It is a breeze, I know you will be pleased when it is complete. Good luck. Let me know when you are finished. Have a great day. That just makes life so much easier! Iam in need of a new one and have been putting it off. Not any more. And I like the straight sides with just a center pleat. Thanks to you AND Mom!! there is another item I demonstrated the velcro/skirt idea with. Baby cribs are as exhausting as regular beds to apply the skirt. You can use the same velcro idea with the crib. Attach the velcro with glue to the outside edge of the springs. You can remove the center of a purchased skirt, just like for regular beds or you can make any type of velcro skirt then simply attach it to the spring. You can make the skirt as long or short as you preferr. 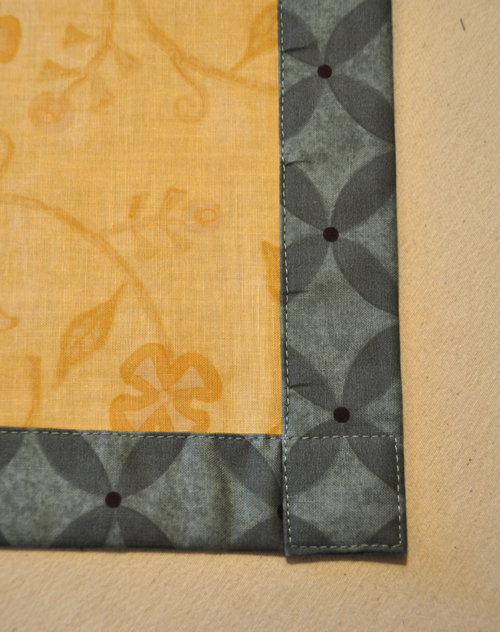 Making a set of simple gathered curtains for the windows to match the skirt is a great idea too. This is genius! I have always hated putting on bedskirts and how much they shift when they are on – I will *definitely* be trying this!! I am so excited now its time to find a foot for my machine to sew velcro. Any recommendtions or is there a specific one? Your mother deserves the Pulitzer Peace Prize – she has literally saved thousands of lives! Thank you! I love this idea! I will be using a slightly different method though… I don’t want to attach the velcro directly to the box springs or the bed frame, when I decide to switch beds or my kids outgrow theirs, I wouldn’t want it to have a line of velcro around the edge if I was trying to re-sell it or even donate it! But, I already use a fitted sheet on my box springs, just because I hate seeing that “mattress”y look of the box springs. So why not attach the velcro to the fitted sheet on my box springs? Then I can still trade it out for a different pattern if I need to, without having to buy another sheet! I could even put the velcro along the bottom of the box springs that way (not sure if that would look right…), and have another layer of color… Hmm…. I was in planning stage of making a bed skirt when I happened upon this site. (I just joined PinIt.) I was going to make a solid color skirt to match my new multi-colored quilt spread–boring!. Now I know it will be o.k. to use a contrasting print and the bedroom police will not be after me. Thank you muchly. OMG!! LOVE THIS!! I can’t wait to make this for my bed and I am going to make one for my daughters room so that I don’t have to look at all of the storage stuff under her bunk bed. I think I can just Velcro it to the back/underneath. I can’t wait!!!! Sou brasileira e adorei sua técnica. Eu também costurava a saia da cama num retângulo, mas dava muito trabalho e depois era difícil de trocar. Agora com essa técnica do velcro é muito mais fácil. Parabéns pelo belo trabalho e obrigada pela dica. This is awsome. I did it. In fact I bought a sheet set and cut the flat sheet into the strips to use as the bed skirt, so now my sheets match the bed linen aswell. Have wanted to do this for years but didn’t ever do it, thanks for the directions! Hi, hoy do i put the velcro in the bed? Wire hog glue? I didn’t get the pictures with the written instructions so I’m not sure about the fake pleat part. I plant to make a couple of the bed skirts anyway. Wish me luck!! Oh my goodness….why in the world didn’t I think of this…..LOL I just got married and bought a beautiful new comforter set and my wonderful husband has a King size temperpedic bed….It is heavier than heavy. It would take like 3 or 4 people just to manuver it, so needless to say my bed skirt is just barely showing on one side, I can’t wait to do this it will be perfect!!!!! Thank you so much!!!!! I love this….I have only one question. I’m sure it’s me, but when you sew the short piece in the middle for the pleat. How do you get the pleat look if you are sewing the velco all the way across? I was thinking you would have to create the pleat then sew the velco, Did I miss something? I’ve got a new comforter set for our King size bed and instead of using the new bed skirt in the traditional way (back breaking lifting the top mattress and never getting it to fit just right), I was going to just cut away the center sheet and figure a way to attach the bed skirt some other way using velcro. But, first I decided to check the internet to see if I could find a tutorial. What luck!! Yours was the first one I clicked on..and here I am. I will be using your method as stated above for existing bed skirts and I might even make one on another bed with wooden sideboards. Thank you so much for the step by step picture tutorial. Thanks to your Mother too! Love your method! Wondering? Does the bed skirt just wrap around the corners at the bottom of the bed? Or is there a faux pleat at each corner–for a smoother turn? Also…how would you handle a dual king that splits in the middle? Not sure what to do–whether to have a short wrap around, say 8″-10″…because it could be bulky to have bed skirts on both sides of the box springs that are side-by-side. Also, on the boxspring at the bottom of your bed you had a “fake pleat,” which is a very attractive visual detail. Since I have 2 beds attached to 1 headboard, what would you do where the 2 beds meet at the bottom of the bed to simulate that fake pleat? What a fantastic idea! I too have a bed that sits fairly high. Actually a queen size sitting on the elongated rails of an antique double bed. I do have a bedskirt on it that I love, but it does not quite reach the floor. I think I will modify it with your technique and add an “underskirt” to the bedskirt. I’m sure this will work with a gathered dust ruffle as well, which is MY preference. Isn’t it lovely that we are all different in our likes and dislikes. The world would be quite a boring place if we were all the same. I do not sew but I love the colors and fabrics on your quilt. I coveting it just a little bit. I’m an avid seamstress of 55 years now and this is totally awesome. I too have been putting off redoing my bedroom just for that reason. Didn’t want to take the time to attach another bedskirt to a large piece of fabric and watch it shift around. This I will use this week and get the project done. But, I think I’ll even cut one step out. If I want pleats I could lengthen the fabric and just fold it and stitch in the fold as I sew on the velcro this way I can have pleats all around with very little work. Thanks for inspiring me. Have the hot glue gun and velcro ready. Thanks again for making my life easier as I work 7 days a week and have very little time during the holidays to complete this task. I’m certainly going to start following you now. Thank you, I have back trouble and the old way of removing mattress held off making dust ruffle. Thank your mother greatest idea ever. Will no make my bed skirt. Really like this idea. I was thinking about attaching the bed skirt to an elastic band rather than velcro because I really don’t want to hot glue on my box spring. Do y ou think that would work? So… I have one side attached to the bed. I used the glue on type of velcro….which worked great but I cannot stitch through it, so after gumming up a few needles I just stitched the “pleat” and then pressed the glue type velcro back in place….not admitting how long it took me to just make the one side….but at least I only need one end as the bed sits up against the wall. It’s a really neat idea, thanks so much! WOW! that is so awesome! I made a bedskirt for our bed by sewing a border unto an old fitted sheet that I didn’t need anymore. The fitted sheet goes on the box spring and the dust ruffle stays in place nicely. But THIS!! Wow, this is SO much better! I can’t wait till I have to make another one and get to try your idea! Thank you for the awesome tutorial 😀 I’ve been either making or converting traditional bed skirts since the early 90’s. The First one I made i used buttons (curved needle to sew the buttons on the mattress) with Velcro in areas needed. I can’t stand that center panel as I cannot wait around for my husband to help move the mattress just to wash and iron the dust ruffle a couple times a year (we have animals). In process of making a new dust ruffle for our new king size bed. Picked up a couple silk (i. e. polyester) curtain panels. Going to use the lining (same color only sheer type fabric) for possibly a line of small ruffle towards the bottom or maybe at the bottom of the tailored panels. Anyhow, thank you for the great tips! Again thank you for sharing. I was just going to sew to a fitted sheet. This way the sheet is permanent and the “skirt” will be easy to change. I love this tutorial and I can’t wait to try it, but I am very new at this. I have to order the fabric online and I was wondering if you have a general calculation for the amount of fabric needed. I will have to make all three sides with the length being 78″ and the width is 80″. I’m thinking 3-4 yards? Yes – It’s a cutting mat from JoAnns. This is also great for the back of a couch or chair that the cushions don’t come off. I mean seriously how many times have you dropped your phone or remote down there and had to become a contortionist to get them back or had to do surgery for retrieval? How do you attach the other side of the Velcro to the box spring? The Velcro is sticky on the back side so you can just stick it to the box spring. Thank you, thank you, thank you!!!!!!!!!!!!! You have just saved me $185 and made me the happiest woman alive. I can’t wait to get started! 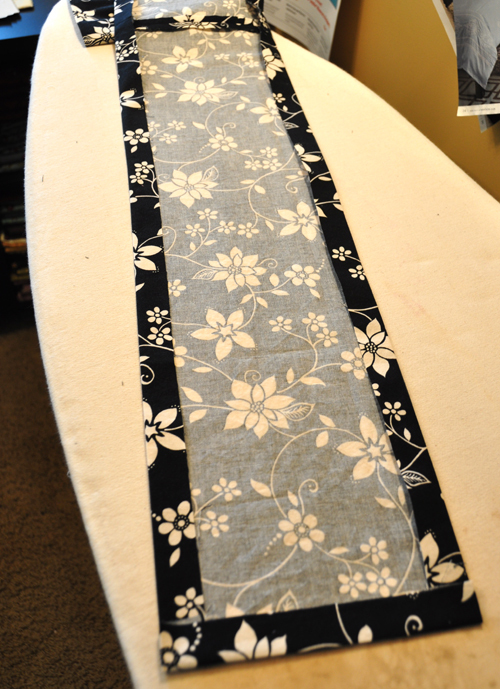 I rarely sew, & don’t have much skill with it, BUT….I have a pillow top waterbed and a black bed skirt. Suffice to say that to wash the skirt I’d have to drain the bed to remove it. Not motivated. Needs washing, but what a great idea you just gave me. Thank you soooo much! This one isn’t for looks as much as necessity! Awesome!!!! Thanks to you & your mom. What a great idea! My daughter has just upgraded from a toddler bed to a full size bed and I have been trying to brainstorm on how to customize her decor. Thank you so much for the idea and tutorial. Has anyone ever tried to attach a bed ruffle to the comforter? I am not a seamstress by any stretch of the imagination so whatever I decide to do will involve asking Mom for help. Anyhow, I thought one could either sew Velcro or snaps onto the bed ruffle and do the same to the comforter. Please feel free to share your thoughts. I love the look but hate it when the bed ruffle gets off-center and you have to move heaven and earth to get it straight again. PS – thanks for the tutorial and pictures. I am soooooo addicted to Pinterest. My family may be planning an intervention any day now! Lol! Attached a edge of fabric (about six inches) that has been doubled to the top of the skirt in lieu of using a solid piece of fabric that covers the whole box spring …attach to box spring by using giant safety pins or purchase the “push pins” from Bed Bath & Beyond. Been doing this for many years…saves time and money. Great idea. I plan on making a bed skirt of my own. What an awesome idea! I love it and can’t wait to make one. Thank you Thank you Thank you! It was very generous of you to share this information. Thank you. Love this! Can’t wait to do it!!! Thanks Mom!! I think I can do this! Very pretty too. Have you detemined if any particular fabric blend works well for this project? Cotton/Poly? Cotton? Flannel? Just curious. If you don’t want to use the velcro method, you could do what a sewing teacher told me. 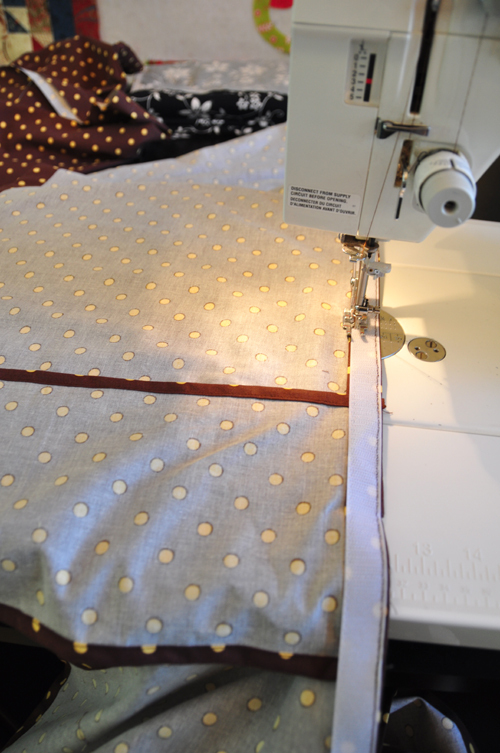 Use an old fitted sheet and attach your fabric to that. It won’t shift. Just made a bed skirt from your pattern its turned out great and what a simple and effective idea. What a GREAT idea! Thanks “Mom”! I have a king size memory foam bed and it’s crazy heavy. My dust ruffle is so hard to take off the bed and wash. I’m sure the dust mites are happy but now I’m happy to know there is a solution. I love your tutorial. I’ve made bedskirts before so this was very helpful. I’ve also turned a pre-made bedskirt into a velcro-type so I wouldn’t have to lift the mattress each time I needed to wash the skirt. One question: Where did you get the table you have your work laid out on? I love it!! I am looking to create a craft room in my new home and this looks like it would be perfect. Thanks for your help. Thank Mom for the instructions – you both did a great job. I love this idea! I need a bed skirt on my bed plus my mother-in-law had asked me to make her a new one…plain with no frills. I never thought about doing it thus way…genius!!! I could see the dust ruffle fabric – with the center pleat – as window toppers, also! Very cute. Brilliant! I get on it right away! Thank you so much! I’ve tried to find the answer already, by reading through all the comments, but I can’t seem to find how much fabric, in yardage, I am going to need for a queen size bedskirt with a 22″ drop. Even just an approximation would really help me. Anyone? If the fabric I buy is under 44″ wide, I’m wasting a lot 😦 and it appears I’ll need 7 1/2 yards. Does that sound right? Thank you. Hi Darci – A 22″ drop is huge! You must have a really high bed, so that means you will need more fabric than usuall. For a queen, you need 6 cuts at approximately 26″ (two cuts for each side and two cuts for the foot). You can use your scraps from the foot board strips to make the pieces that go behind the pleats. 6 cuts at 26″ = 4.333 yards. You could get a little extra, just to be safe. I’m not sure how you are arriving at 7 1/2 yards, but this is what I come up with. Yes, it is a high bed! But the 22″ was including the hem allowances – sorry I didn’t make that clear. Thanks for your input. I found 44″ width fabric today that didn’t have a salvage edge. so hopefully I can cut it nice & straight into 2 – 22″ pieces. I got 4 yards. Thank you. A few years ago I used this method to make a bed skirt for a friend who had a high platform bed. I attached the velcro to the wooden base and it gave the bedroom a whole new look. She loved it! FYI: When we were on a cruise recently, I noticed that all of the bedskirts were attached by Velcro. However, they were made of high quality faux leather. My first thought was NO IRONING, plus the ability to wipe clean. I’m planning to try this real soon! Ive always used duct tape instead of Velcro. Saves lots of $$$ not buying Velcro. I attach the duct tape when I lay the fabric. Has been on for years and no problems! I saw this on Pinterest and I absolutely love this idea. I have bedskirts that I don’t use because we have a king size bed and it is impossible for me to remove without help. You know how heavy those mattresses are??? But, knowing these tips I’ll simply recycle the bedskirts and re-use the fabric to create the velcro version. I can hardly wait! Thanks to you and your mom for sharing this awesome idea! I really like this. How much fabric did you use for your bedskirt? I ran this pattern off in 2010 and saved it. I am going to make this as I have painted both the bedroom and bathroom the same color! I had made on 15 years ago and it has to go. This idea is so easy and just fantastic. Thank you. Thanks for the great tutorial. I wish I’d thought of this BEFORE I redesigned our king sized bed skirt. Big job so it may be there forever! But I need one for the guest room so this will work very well. Thanks for your time and effort! Oh my word! I’ve literally had this on my mind for over a year. I’m not a huge fan of sewing BUT I’ve been trying to figure a way to EASILY velcro on the skirt part to the rectangle part so that I could remove it easily and frequently for washing. For those of us with cats….there’s always one or two spots completely covered with hair where they decided they would use the dust ruffle as a door. SO glad I found this post. Thanks for sharing! great work. thank you for the inspiration! Thank you for the great tutorial. I found a light weight upholstery fabric remnant and Velcro at @ 70% off sale at a local national fabric store. I was able to create a beautiful tailored Pottery Barn knock-off for about $30. I don’t think it would have turned out half as nice without your instructions. Thank you and thanks for posting it on Pinterest. Do you think this would work on a hospital bed??? Or do you have suggestions???? sorry if this has already been asked, but how well does hot glue hold that velcro? i could imagine when i take it off to wash, the velcro (both pieces) would come off too? I haven’t had much for issues with the glue pulling loose. I have one spot on one bedspread where it has, so I just need to re glue that little corner. I think if you have a decent line of glue and you remove it without yanking on it too hard, it wouldn’t be a problem. OK….I have been doing something like this for years, however I must be a redneck….I use duck tape to fasten to box springs….am I a redneck? Cheaper than Velcro and a lot quicker. What luck to find this!!! Thank you for sharing! I have several beds i’m going to convert to this method and will be making a new dust ruffle as well… thank you so much for posting this!!! PS. 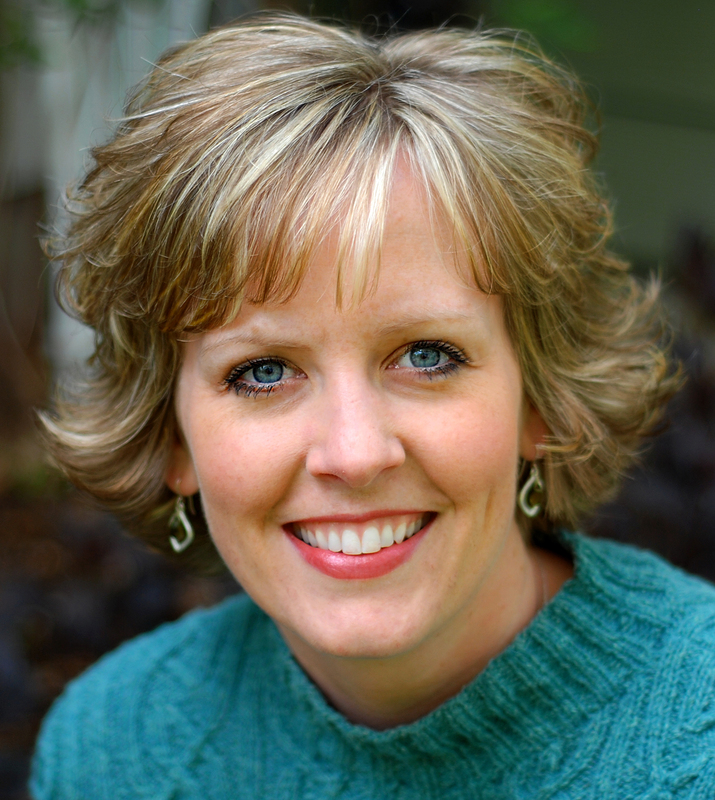 This blog was the first to come up when i googled my question on dust ruffles… GREAT JOB!!! I am making this for my granddaughter for Christmas and I love it! It is coming out just like I had imagined. I have one question for you…where did you get your cutting mat? It looks enormous, just what I would love to have for my cutting table. It’s from JoAnns. I love the size but the material that the mat is made out of is not the best quality. I have been looking for a bed skirt without ruffles and fussy stuff for quite a while, but all I can find in the store are ones that look cheap and are of poor quality. This is perfect and it doesn’t have to be white and it will be perfect to hide the baseball bat my husband keeps under his side of the bed. Can’t figure out if it’s for protection or just a convenient place to store it! Holy WOW easy…. I think i can do this… Thank you Mom…. I loved this idea and have completed all of it but attaching the Velcro. I purchased the sticky backed kind and am having a horrible time with my machine breaking threads and sewing sloppy. I’ve changed to a heavy duty needle and adjusted tension both ways, but no luck. I’m afraid I’m going to break my machine if I try much longer but I’m almost finished! What am I doing wrong? You use the sticky back Velcro on the box spring (or you can hot glue regular Velcro to the box spring). You use regular Velcro for the part you sew to the bed skirt. I was completely perplexed about how to sew a dust ruffle/bed skirt until I read your tutorial. Thanks for the info. Now I have a question. I’m working on a batik quilt for a queen size bed. Do I need to make a batik bed skirt or would a regular cotton bed skirt be acceptable. Thanks for you answer. It’s just my opinion – but I would be more concerned about finding a color that matched really well, than it being the exact type of fabric. Batiks would be really rich looking and very nicely coordinated, but not essential. Hi. I am so happy to have found your tutorial. Today by chance I found fabric shower curtains that look like they should have been apart of my Bed Spread Set. Can’t wait to get started. Thank you and your Mom so much for sharing. I made this skirt, the pleat was so easy. Thanks! I lined it and I think it came out really nice. Now I am ready to hang it on the bed. I got velcro from Amazon, even with a 50% off coupon at Joanne is was still less money. My question, where did you “tack” the skirt to the matress? Tucked between the two mattreses?To the top of the bottom mattress? I have not hemmed them yet, so i have some flesibility. Thanks for a great turorial! Love this!! Now I can get a bed skirt in the right length for my bed height. I can’t wait to start on one or more for my house. Thanks for this! First of all, I wanted to extend a big Texas THANK YOU, for posting the instructions for the Velcro bed skirt. I think it is so kind of you to offer this FREE of CHARGE, when so many, who have discovered wonderful short-cuts and ideas, which really help the average income families, charge a price for the knowledge. I truly appreciate your doing so. I, too, although not brave enough to be a “blogger,” post ideas I come up with on Facebook. Again, THANK YOU SOOOOO MUCH for your kindness! How do you attach the pleat? It’s seems like you would have to add Velcro to the outs of the pleats as well to keep them in place….? I can’t wait to try this and my level of sewing is beginner. Thank you! Hello, I my sewing is at a beginner level and this seems easy enough for me to do. I have one question. How do you attach the pleat without adding more Velcro to the pleats? How does it stay in place? Thank you so much I can’t wait to try this! Great project and timing! Thanks so much! My hubby always steps on and tears the dust ruffles that you buy and ruins them but this will just pull loose instead because I’m going to velcro it on. Can’t wait to get started and I’m headed out to find some fabric now. This is a terrific idea. My question is a little out of the realm of this blog. I have a vintage quilt top that was hand stitched by my mother. It has blocks about of various sizes. I have never had it quilted because it is a full size and I need a queen size. I can’t see the top of the quilt you have here, but I like the row of triangular pieces, and the strips on the sides. Do you think it would look okay to do this to extend the top, even though I have none of the original materials? Can’t wait to start on my new bedskirt. Thanks for this tutorial. You just buy the sticky Velcro or you can hot glue it to the box spring. My question is when you hot glue the velcro to the box spring and you take the bedskirt off to wash, I invision the velcro coming off with it. Is there a special glue stick that will be permanent, stick to both box spring and velcro? I have had a couple issues with the glue coming loose, so I have just re-glued it or stapled it in place. This method looks very simple, however, you failed to mention how much yardage to purchase for any given bed. I need enough to make a king size skirt (76 x 80″) mattress. Also must I use 45″ or 58″ widths for this project? New to sewing but I think that I can so this!! Can you estimate the fabric yardage that I’d need for a twin bed? I thought of a way to make a bedskirt for my softsided king waterbed which cannot be lifted up due to the heavy water. I want to use a solid white fabric that is not see through and thin like the ones pre-made at stores. At Target I found a Threshold solid rectangle tablecloth for $17 that is 70×120 inches. I will cut the panel in three lengthwise strips making the center strip wider since I have to put a hem on one side of it. Nice thing is the other two strips will already have a seam on them as the tablecloth comes hemmed on 4 sides. I save some fabric for the bed corners to mimic a corner pleat and just barely cover the two ends at the corner of the piece to allow a peep show of the corner piece. All pieces will have hemmed edges for a professional look. It will be a flat tailored skirt. My mother has sewed for many years and she said I could use those corkscrew upholstery tacks to attach it or the hook & loop. I don’t want to use hot glue as I want to remove it to be washed if needed as I have a dog that may or may not lift his leg. Glad you gave this tutorial. For soft sided waterbed owners this gives an option to change the fabric without draining the water. Thank you. That is a great idea…the fitted sheet instead of gluing Velcro on the boxspring. Thanks! I’m just finishing mine! A little time consuming but a beautiful finished project. I have one of those beds that move and lift and not a real box spring. It has metal brackets (ugly) to keep the bed in place while moving. Therefore it has an unusual look. I’ve used upholstery tacks (that can’t be seen) and tacked my bed skirt on top of the funny looking piece under the mattress. I had to make a few allowances because of the brackets but everything stays in place and the bed looks a lot less mechanical but comfy and inviting. And adds a unique one of a kind flair! Thanks for sharing this! Love this! Thanks for sharing mom’s idea with photos & tutorial. And THANKS Mom! I’m a quilter and buy extra fabric to coordinate the quilts, curtains and bed skirts. I also use a fitted sheet for the skirt. To make sure it doesn’t “move” with use, I use a couple of the elastic fitted sheet holders in each corner. I have an adjustable bed so a traditional bed skirt will not work. This is exactly what I need! Thank you, Thank you! Now my bed will look nice! I will be watching JoAnn’s for those sales. Any suggestions to making a dust ruffle for an adjustable bed? I’ve always used your velcro and have loved that for years. Not sure about this adjustable bed. Excellent tute. Looking forward to making this. I have a tall 4 poster bed with wooden sides. I use a tension rod on the 3 sides to put the dust ruffle on. It can be made gathered or tailored. I do like the Velcro to the bed method. Thanks, Mom! Hi! Love this! Going to do it! I really hate traditional bedskirts! Especially if you have a heavy, hard to move mattress! Put the smooth side of Velcro on the bed skirt. That way, when you wash it, it won’t get stuck to itself, or anything else in the washer and dryer. Thanks for such a thoughtfully put together tutorial! Loved your tutorial. I made one recently and I just attached it with T-Pins. No need to mess with velcro and the expense of it. Thanks, good tutorial & the skirt I made using your steps looks great, just the way I like them to look & without fussy gathers. I am making this for my daughter’s dorm room that doesn’t have a box spring. Any ideas on how to put the velcro in place when it is just the bed?